If there's something strange in your neighbourhood, who you gonna call? Barry Shaftoe, demon hunter, a man with a very single-minded approach to dealing with ghosts and one of the handful of characters in Jack Evans' epic tale of Cluedo gone wrong. 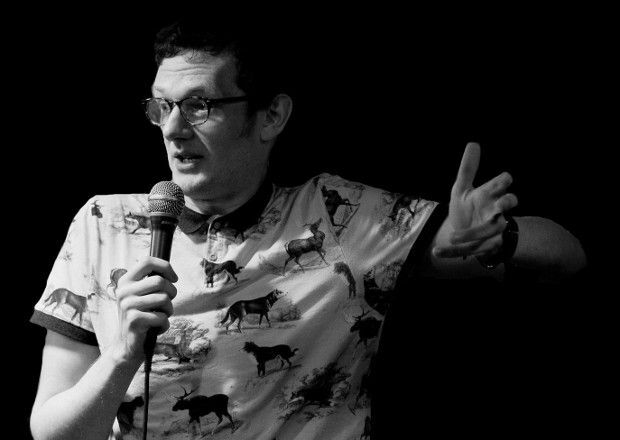 Evans is a rangy, confident stand-up who bursts straight into working the crowd with material that's knowingly near the edge politically but is clever enough to pull itself back quickly. This Free Fringe show is a sort-of-coherent, if ramshackle, narrative that uses crudely drawn yet funny animation to cover costume changes and link segments. And the title means nothing, by the way. Another character, Maurice – the pick-up artist, men's rights activist and Brony – is a great idea that needs a bit more depth, but his jump out of character to explain of what those terms mean is brilliantly condensed bile. One thing that lets it all down is the Bald Eagle (David Stanier), who doesn't seem very confident and can't keep up with Evans' manic energy. It's not a must-see classic by any means and needs a lot of polish, but Evans has the imagination, energy and comic skills to go far, so catch him now. Cowgatehead, until 27 Aug, 4.45pm, free.